On Sundays it might take up to 24 hours to get a reply. You have to wait, since we (the user forum) cannot help you. But here I need to ask, my name on digitalocean.com, they ask me to submit papers for verification, but my name is not the same because on digitalocean.com I put my nickname. I don't understand what you're asking, but my guess is that Support is asking for verification of your identity (that's your full name among other) to correspond with the credit card information. They do not require me to correspond to credit card information, because I use paypal, I send the picture to you (https://upload.cc/i/MPkdsT.png) you see will understand, here they ask The papers to verify but my NAME at digitalocean registration is my nickname, but the NAME on it is different from the time it was registered digitalocean, you know what I mean? There is no such thing as "nickname" anywhere in the DigitalOcean account. That is something only used here in the community forums. 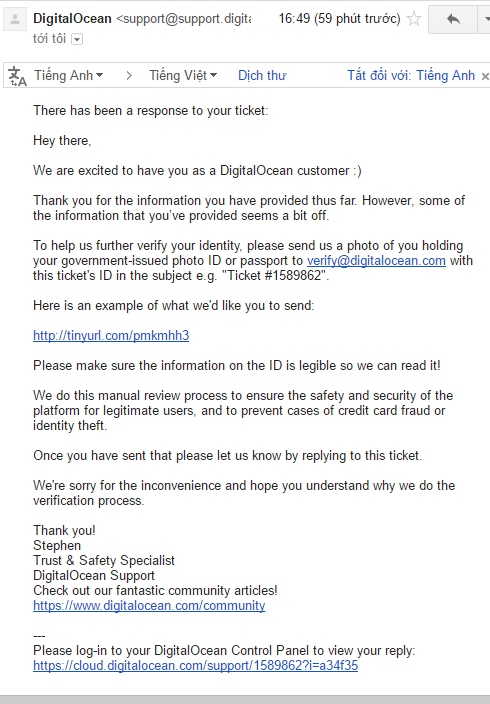 DigitalOcean need a picture of your official ID or passport, since they need to verify your account, which could be to correlate with PayPal or for some other verification reason, which only DigitalOcean support can give you an answer to. Again, we (the community forum) cannot help you.